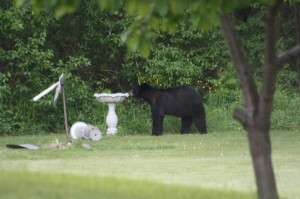 SCRIBA, NY – A wandering black bear has caused quite a stir in Scriba. It was first spotted on Wednesday at a County Route 1A residence about a mile east of Novelis. He stayed for about an hour before heading back into the woods. There were a couple reports of the bear walking through St. Paul’s Cemetery on Oswego’s east side on Thursday. A witness said it walked through the cemetery and then ran off into the woods. Scriba resident Joe Falcetti took some photos of the critter when it was across the street in a neighbor’s back yard. “It makes you wonder if this is the only one or is there another? Maybe there are some cubs around, too,” Falcetti said. Oswego Police Chief Tory DeCaire said if anyone does encounter a bear, do not approach it. I was shocked to read about the bear being so close as far as St. Pauls cemetery on the East side. 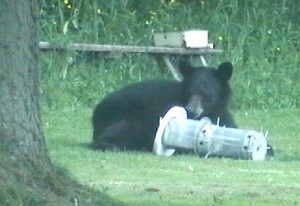 I have never heard of a bear being so close to Oswego. Have other people seen bears this close? I would like to hear about it.